I am so incredibly honored to give the first guest blog spot at Espressos of Faith to my dear friend Tammie Wommack. I know her from my time living in the Republic of the Marshall Islands. Tammie and Rick have turned deep loss into a path of healing by volunteering their time to help others. They gave up a regular income to live a nomadic lifestyle, going wherever God leads them to help others in need. They have done so much to raise suicide prevention awareness and comfort those experiencing such tremendous loss. 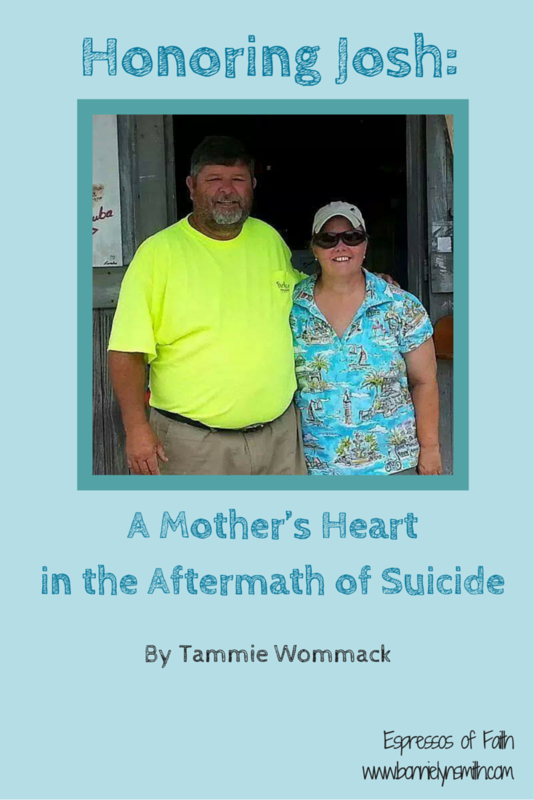 I had just met them when they were called off the island with unimaginable news, and I got to know them as they returned and started the difficult journey of living with their “new normal.” Tammie speaks from the heart and sheds some light on a mother’s thoughts and feelings a few years into this new chapter of life. In light of the recent suicide of Robin Williams in the news, I felt it was a very good thing to hear the perspective of a mother. I hope we can get Tammie on Espressos of Faith from time to time to bring more understanding to this important issue, help us know what brings comfort to those left behind, and inform us further on suicide prevention awareness. At first, I really didn’t know how to respond—because I heard the question in the wrong way. I said, “Do you mean am I glad Joshua is dead?” And then I quickly responded with an answer about our life now. Well, of course they did not mean it that way, but a mom is so quick to want to protect no matter what, and somehow, I always have the guilt of his death uppermost in my mind; it colors my thoughts and actions a lot of the time. Rick and I have found a new direction and a deeper meaning to our lives. We believe that our efforts to honor Joshua have resulted in making a difference in other people’s lives. We, as a couple, are closer, and we cherish our families and time together. We both have a deeper and more meaningful relationship with Christ and have learned to depend on Him for everything. We have been humbled, to be sure, but we love life and all that it entails: both the good and the bad. Our families still do not understand our deep desire to give back; they see it as a decision to quit working, especially on Rick’s part, and truly, in the beginning, we were just running from our grief with no real plan. But God has opened the door, and we have stepped through it!!! We are not regretting our decision to give up so much because we have gained even more. We live on a very limited income, but we LIVE it to the fullest. Small things now are so much more important to us: time with family, being thankful for the little things, grasping with both hands the beauty of whatever place God allows us to view. Our advice to everyone is: Don’t wait until it is too late to love the ones in your life whom God has blessed you with. Don’t sweat the small stuff. (I know that was a book; maybe I need to re-read it.) Always try to help whenever and wherever you can. Embrace and be thankful for what you have, and most of all, give God the glory in everything that you do. Thank you for sharing your heart and being a blessing to others.. God does promise to use our pain for His glory while He walks through with us. Sometimes it is hard to hold onto that promise, but He is faithful. Yolanda thanks for the encouragement and support. 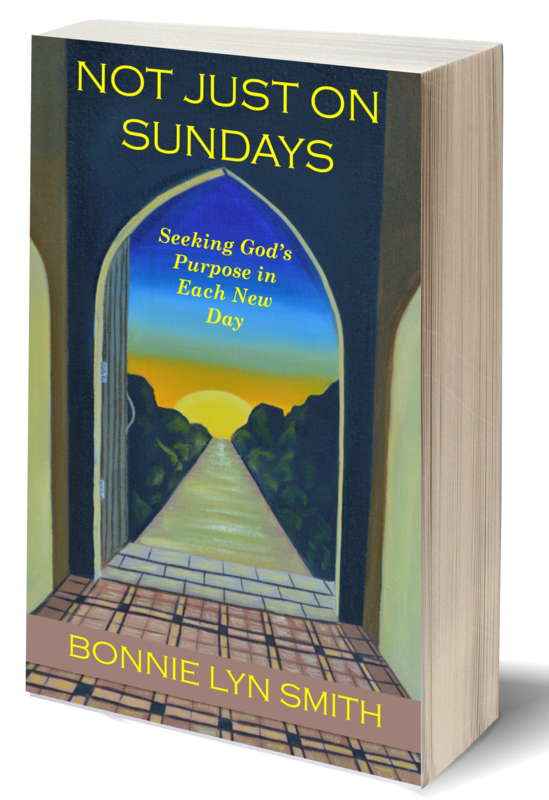 …please stop by Bonnie Blog again. God Bless You and your family.